After the initial contact your designer will come to see your garden to discuss your ideas and wishes. Through discussion, your designer will be able to gain valuable insight into your requirements and style of garden that you wish to attain. Making suggestions drawn from their experience, they will be able to steer the process to achieve the ultimate outcome. The survey of your garden is undertaken during the consultation. This enables the designer to create initial visualisations and sketches as the first stage of the design. If you are in the process of a new build, we have the experience to work closely together with your architect to achieve a cohesive project. With a team of experienced and highly qualified landscape architects and garden designers, we are able to create innovative and exclusive designs. Designing your garden is a two-way process where we highly value your input. Once you are fully satisfied with the proposed design, a full design together with a detailed quotation and schedule of work will be presented to you. 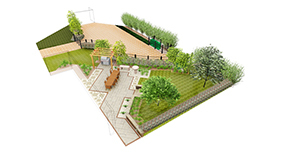 These detailed designs include horticultural planting schemes and 3d visualisations enabling you to envisage your finalised garden/landscape. Our skilled landscapers and construction teams will install your garden or landscape, project managed by our experienced project managers. Our project managers will oversee the project from start to finish enabling you to focus on your own priorities. They maintain the highest standards of communication and will be your designated contact person. 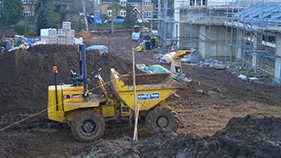 Our team members are DBS checked and fully trained and qualified to carry out the work.